The Casa Med SE Low bed is an attractive low profiling bed with a four-section mattress support. It offers a luxurious range of positioning options providing maximum comfort, support and independence. The low positioning from the floor makes getting into and out of bed easier and safer. The Casa Med SE Low can significantly reduce the risk of pressure sores and assist fluid drainage and poor venous return. 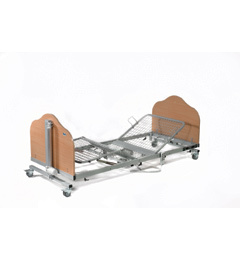 It also provides safer, improved mobility and transfer for easier access to wheelchairs and commodes as well as safer, easier lifting and lowering and thus help prevent back injuries caused by lifting or turning.